As soon as the horrible news broke yesterday that an arson fire had destroyed the Manchester Dogs’ Home in the U.K., killing at least 53 dogs, people began offering their help and making donations to provide for the 150 surviving animals and rebuild the shelter. As of Friday afternoon, more than $1.6 million had been raised via a donation page set up by the Manchester Evening News. Celebrities including Ricky Gervais and Piers Morgan have been helping to spread the word about the fund. “£5 here, £10 there, the people of the UK gave what they could and will change our world as a result,” the Manchester Dogs’ Home tweeted earlier today. A 15-year-old boy has been arrested for setting the fire around 7 p.m. last night. The Mirror reports today that he had recently been hospitalized after being attacked by a dog. Colin and Colette Ballance, who live on site at the Manchester Dogs’ Home, managed to save two dogs when the fire broke out. The fire affected three areas of the shelter, according to Manchester Dogs’ Home spokeswoman Jane Smith. The Guardian reports that when local residents became aware of the fire, hundreds of them rushed to the site with dog food and bedding. Some people even risked their lives trying to rescue the dogs. 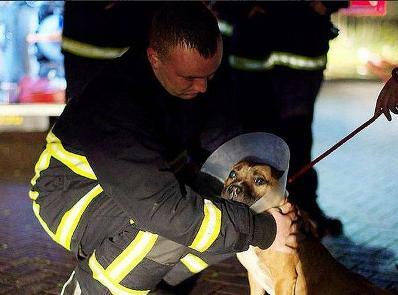 Jason Dyer and his nephew Dean Rostock managed to save at least 20 dogs from one of the burning buildings. An online petition requesting that Dyer and Rostock be awarded for their heroic efforts has more than 1,200 signatures as of Friday afternoon. The Manchester Dogs’ Home, founded in 1893, takes in about 7,000 dogs each year. It finds forever homes for 95 percent of them. The Manchester Evening News reports that workers from the construction company Powerhouse Property Services have volunteered to rebuild the shelter, free of charge. They’ve set up a Facebook page where other workers can also volunteer their services. “A million. A million good hearts, a million amazing people thank you thank you thank you,” the shelter tweeted today. To make a cash donation, click here. Post a picture of your dog, alongside your donation, on social media using the hashtag #DogSelfie and/or #ManchesterDogsHome.